I know I say this a lot about Yorkshire things, but we are so lucky to have access to so many things on our doorstep. Bempton Cliffs is an RSPB nature reserve on the cliff tops at Bempton, near Flamborough. It is home to half a million sea birds which nest on its craggy chalk cliffs between March and October. It is quite a spectacle to see all these birds which include Gannets, Guillemots, Razorbills, Fulmars, Kittiwakes, Herring gulls, Shags and of course the iconic Puffin. If you are lucky you might also spot a seal, porpoise or even a whale in the sea below the cliffs. Bempton cliffs has a visitor centre with a cafe, toilets and shop which stocks lots of bird and wildlife related things and a very good selection of binoculars. There are also tables and benches around so you can stop for a rest or have a picnic if wish. There is a path (fenced off) which runs along the cliff top to several viewing platforms and there are often RSPB people on hand to impart good bits of knowledge and let you have a look through their telescopes. On our recent visit, we were lucky enough to meet the very informative Sophie who let us look through her telescope at a puffin in its burrow and then told us lots of interesting things about the birds eggs, in particular the Guillemot egg...it is quite vividly patterned and apparently each guillemot has its own individual pattern when laying an egg and each of its eggs will have this unique pattern. This is to help the birds identify their eggs amongst the thousands that are on the cliff top – like a Guillemot egg QR code. I find this fascinating and it makes me marvel at how wonderful nature is. 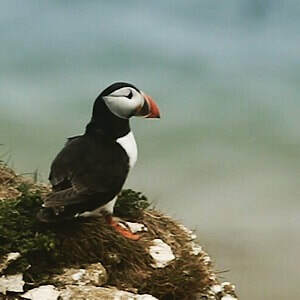 The Child also found this very interesting along with lots of other facts that we learnt like baby puffins are called pufflings; puffins when flying flap their wings 400 times a minute and puffins are very good at holding fish in their beaks – the highest number of fish recorded was 83. We also learnt more this time about the gannets – there is an information board which tells you how you can identify how old a gannet is by its wing markings. We particularly liked spotting the ‘piano key’ gannets which are in their 3rd year, with black feathers coming through making their wings look like a piano. Take extra layers – no matter how warm it is when you leave home, there is a strong possibility that the wind will be properly cold on that cliff top so be prepared! Dogs are allowed on leads. The visitor centre is open from 9.30 to 5pm in summer and 9.30 to 4pm in winter. RSPB members go free, otherwise adults are £5, children £2.50, free entrance for under 5s.